For more information contact our customer care department. 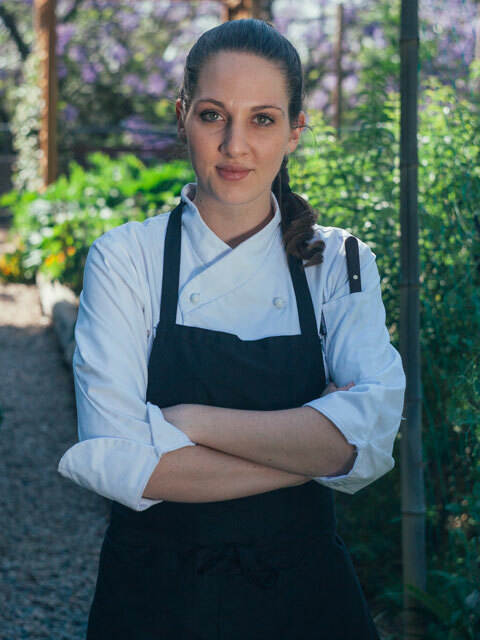 Considering she’s the up-and-coming pastry chef at Joburg’s trendiest five-star hotel, Debbie Diesel is fresh-faced and humble – with just the right amount of sass.She shuffles around her bustling kitchen with the ease and confidence of baking at home on a Sunday afternoon – even though she’s in the middle of lunch service at The Saxon. Diesel was always drawn to the science of baking. “I love the precision of making cakes and pastries,” she explains. 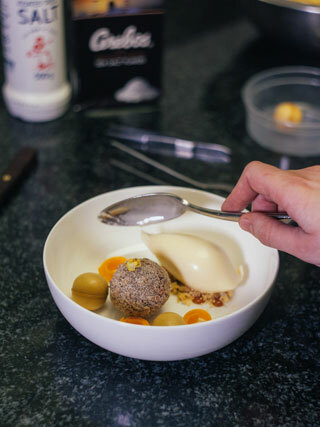 “Cooking allows for a lot more flexibility – adding a pinch of this or a dash of that – but baking requires real dedication to measurement and method.” After her whirlwind Singaporean experience, Diesel returned to South Africa to settle in the Saxon’s renowned pastry kitchen. “My day generally starts at around 3 am. The morning involves prepping and baking seven different types of pastries, three types of Danishes, five variations of muffins and a completely gluten-free banquet,” describes Diesel. 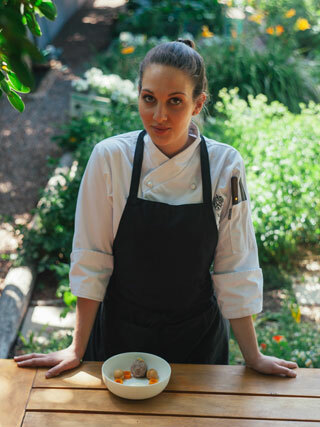 “It requires a huge amount of energy, but luckily it’s a real passion for me.” Her routine then rolls into prep for a full brunch spread and high tea. Tanzer’s company grew exponentially and, after a few years of intense hard work, he decided to sell the company and move into production. He was lucky enough to produce MasterChef South Africa and Reza Mohammed’s cooking show. But cooking was – and is – where Tanzer’s heart is, and, once again, he decided to open his own full-service catering company, Food on the Move. Today, Tanzer runs and manages Food on the Move, creating no-fuss menus for any and every kind of event. His food philosophy is grounded in simplicity – he believes a truly talented chef should be able to make an incredible meal with a few carrots, potatoes and onions. Foams and gels aren’t his style, he likes to keep it simple. 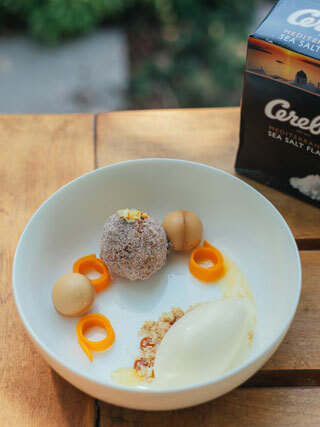 When she was given the 80s as inspiration for her Seasoned: 70 Years of Cerebos dish, she began imagining unexpected flavours and textures, using salt as the base note for her dessert. In a medium pot over medium heat, bring the water, butter, Cerebos salt and vanilla to the boil. Add flour and cook until it catches on the sides and bottom. Transfer the dough to a standing mixer fitted with a paddle attachment and mix for one minute to cool. Add the eggs, one at a time, and mix until fully incorporated. Refrigerate until cold. In a pan over medium heat, combine the roasted butternut, a quarter of the sugar, cinnamon and Cerebos salt. Mix for 5 minutes, stirring frequently. Leave the puree to cool. 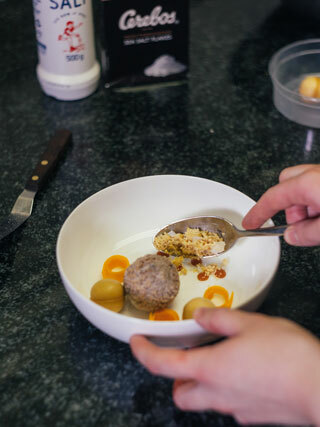 In a medium bowl, mix the butternut puree with the pate a choux. Stir in the chocolate and transfer the mixture into a piping bag. 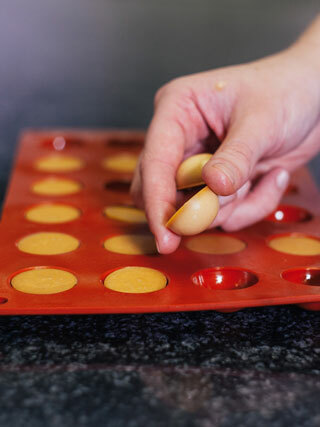 Line a tray with parchment paper and pipe one tablespoon moulds onto the paper. Freeze the piped dough until firm but not solid. If the dough is too hard, it may be necessary to allow it to soften before rolling it. Coat the balls in bread crumbs. Combine the remaining cinnamon and sugar to make cinnamon sugar. In a large pot, heat the oil to 160°C. Deep fry the balls for 5 minutes, in batches. Transfer the beignets to paper towels to drain. Roll in cinnamon sugar and serve warm. Blend the orange zest with the Cerebos salt. Sprinkle a small amount on top of the butternut beignet. Blend the cooked butternut with the brown sugar until smooth and lump free. Add the spices and Cerebos Salt. Add the chocolate and blend to incorporate. Spray and cook small dome moulds before piping in the mixture. 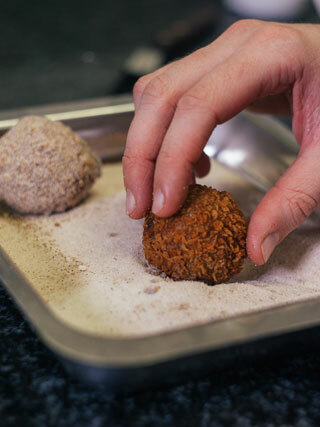 Once set, demould and stick together two halves to form a truffle. Preheat oven to 180°C. Cream together the butter and sugar. Add the vanilla, orange zest and flour. Mix until just combined. Crumble onto a lined tray and baked until golden brown, for 8-10 minutes. Cool the dough and crush into a coarse crumble. Add Cerebos Sea Salt Flakes. Melt the sugar to form a dry caramel. Once the sugar is completely melted, stir in the butter, a little at a time. Stir in the cream and finish off with the Cerebos salt. Cut the butternut in half and remove the rounded bottom. Peel butternut and set aside. Prepare salt crust by mixing flour, Cerebos salt, egg whites and water in a blender. Blend until combined. Wrap the butternut in the salt crust and bake at 170°C for 1½ – 2 hours until soft. Remove the Cerebos salt crust. Leave to cool. Cut the butternut into strips, 1cm – 10cm. 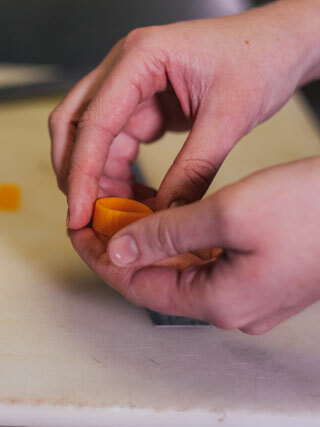 Wrap the butternut strips into rings and place on the plate. Place the orange juice, glucose, sugar and cinnamon in a pot on medium heat. Heat until all combined. Add the egg whites to mixture. Strain and pour into ice cream tins. Freeze and churn. Place all elements together in a bowl and enjoy. 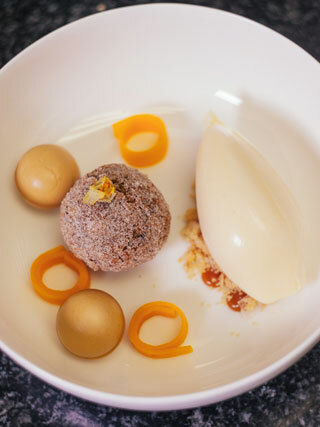 If you don’t feel like creating the entire dish, you can make one or two of the elements as a simple dessert – sorbet, Beignets and salted caramel truffles all work well on their own.